How to create new, sustainability-oriented business models? How to improve the sustainability performance of the business you are already in? 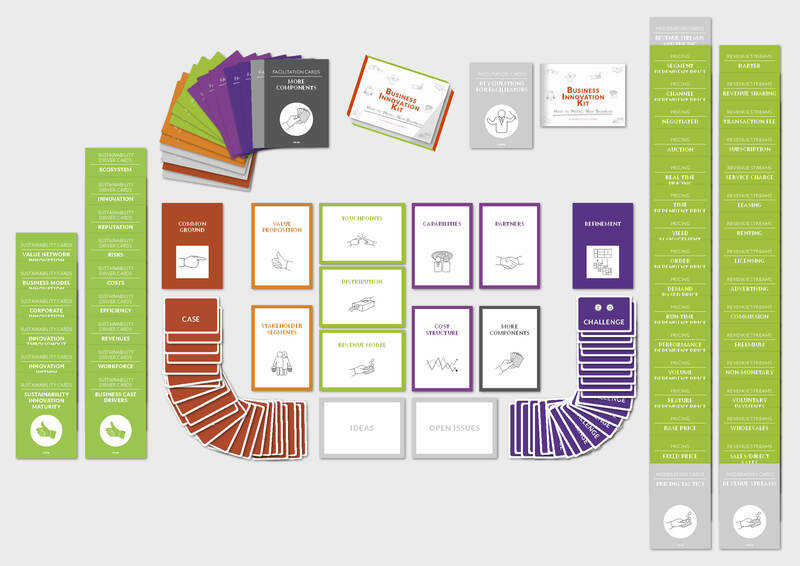 The Business Innovation Kit (BIK) by UXBerlin enables entrepreneurial teams to explore, dispute about, and co-define business ideas and models for new or existing organisations. A structured and focused process guides teams through different exercises, exploring and generating a range of robust and viable ideas. Two new BIK card sets, the “Sustainability Innovation Pack” (currently as a beta-version), inspire new ways to turn organisations’ sustainability-orientation into action. First, users reflect on their current innovation maturity and define the level they are aiming for, considering five levels of sustainability innovation maturity. Second, they work through eight business case drivers to integrate ecological, social, or economic sustainability issues into their business models and their components. The Sustainability Innovation Pack is a research-based and redefined version of the Business Innovation Kit. It was developed by Prof. Dr. Henning Breuer (HMKW Berlin & UXBerlin – Innovation Consulting) and Dr. Florian Lüdeke-Freund (University of Hamburg & Research Fellow at the Centre for Sustainability Management). The underlying research was presented, inter alia, at ISPIM 2014, CSR Conference 2014, VHB NAMA 2014, and will also be presented at ISPIM 2015. An upcoming book on “Normative Innovation Management” to be published by Palgrave McMillan will elaborate on the underlying theories and concepts of values-based and sustainability-oriented (business model) innovation. Contact the authors for copies of their current publications. If you consider using the BIK and Sustainability Innovation Pack in practice in your company or start-up, contact Henning Breuer (info(at)uxberlin.com). If you are interested in exploring this tool in research and teaching, contact Florian Lüdeke-Freund (florian.luedeke-freund(at)wiso.uni-hamburg.de). 1. Sustainability Innovation Maturity – Which level of sustainability innovation maturity are you operating on, and which level are you aiming for? Having agreed upon a shared normative vision in the BIK’s initial “grounding exercise”, which clarifies an organisation’s business model-related vision and mission, users reflect on their current level of sustainability innovation maturity and the level they aim for in the future. 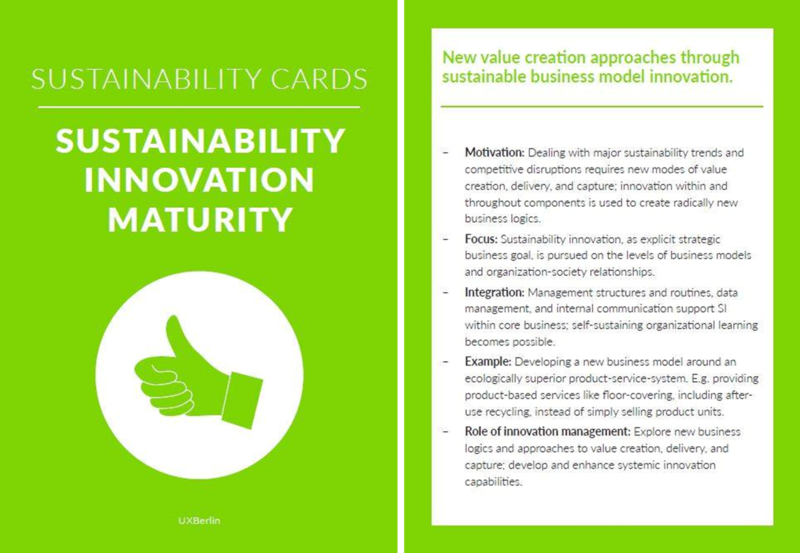 The card set describes five sustainability innovation maturity levels, including brief definitions of each level, characteristics in terms of innovation motivation and focus, and integration into an organisation’s overall innovation management. Examples and illustrations are given. 2. Business Case Drivers – How do you create your business case for sustainability through business model innovation? This exercise adds a corporate sustainability perspective to the facilitation process. Having agreed upon a shared normative vision for an innovation project and the level of sustainability innovation maturity to be reached, ideas are developed for each business model component. 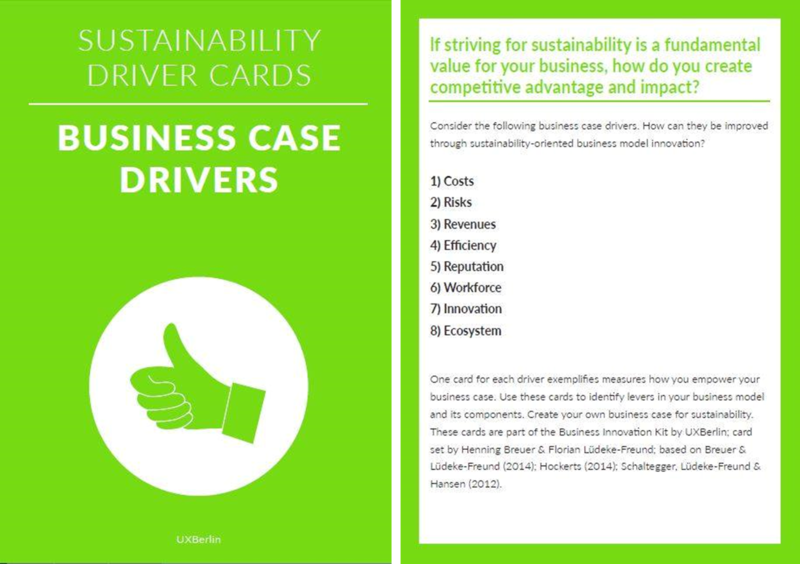 This card set of eight business case driver cards proposes different levers to improve a business model’s sustainability performance in concert with costs, risks, reputation, or network creation, for example. For instance, through offering cost efficient contracting models based on using and sharing technical equipment, instead of simply selling product units. Breuer, H. (2013): Lean Venturing: Learning to Create New Business Through Exploration, Elaboration, Evaluation, Experimentation, and Evolution, Int. 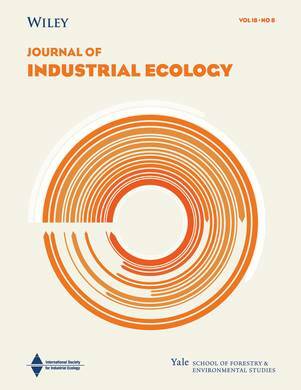 Journal of Innovation Management, Vol. 17, No. 3, Article 1340013.